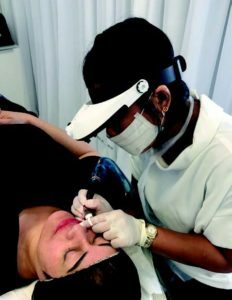 Semi-Permanent Make Up is also referred to as ‘Cosmetic Tattooing’ and is achieved by implanting colour pigments under the top layer of skin to create a semi-permanent line or shaded area. The process can also be referred to as ‘Microblading’ or ‘Feathering’. Cosmetic Tattooing should not be confused with traditional tattooing which is far more invasive with the ink going much deeper into the hypodermis layer of the skin. The techniques, equipment and inks (pigments) used in cosmetic tattooing are very different to those used for traditional tattoos and usually last for a period of 2 – 3 years. Semi-Permanent Make Up is most commonly applied to the eyebrows, as an eye liner and to the lips. Most treatments require a ‘touch up’ session 4 – 6 weeks after the initial treatment to achieve the best result. Bali Secret Beauty Spa provides professional semi-permanent make up solutions for eyes and lips. Tia Anderson has been working in the beauty industry for more than 14 years and now as a qualified cosmetic tattooist specialises in delivering highly creative eye brows as well as eye liner and lips. Want to know more? Call today on (08) 9228 8395 for an obligation free discussion. Now you can have the eyebrows you have always wanted. The shape and colour designed and executed to perfection. Eyebrow feathering is a process where each hair stoke is individually tattooed to create a natural look hair stroke that mimics natural hair growth. The process usually takes approximately 2 hours. Achieve the perfect lines to define your eyes. Lashes appear fuller and no more smudges! The process usually takes approximately 2 hours.